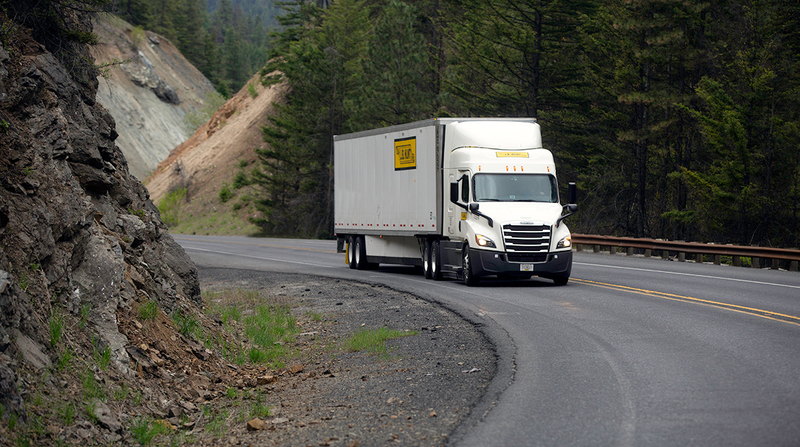 J.B. Hunt Transport Services reported a big bump in revenue in the third quarter as higher rates boosted the top line for each of its four freight segments. Profits, however, did not keep pace as the company dealt with outstanding legal issues and absorbed start-up costs for several large dedicated hauling contracts. Net income rose 6% to $131.1 million, or $1.19 a share, in the three months ended Sept. 30 compared with $100.4 million, or 91 cents, in the year-ago period. Revenue soared 20% to $2.21 billion compared with $1.83 billion in 2017. The earnings release Oct. 15 was accompanied by the first-ever conference call between J.B. Hunt executives and investment analysts, a call that began with David Mee, executive vice president of finance and administration, referring to an arbitration case involving J.B. Hunt’s primary rail partner as “the elephant in the room” and making clear that there would be no comment from executives on the matter beyond a statement issued by the company Oct. 10. In that statement, J.B. Hunt said it would incur an $18.3 million pre-tax charge against earnings in the third quarter due to an interim award from an arbitration judge in a dispute with BNSF Railway over services provided to customers from April 2014 to May 2018. The company could face additional liability once the dispute is finally resolved. J.B. Hunt is the nation’s largest rail intermodal freight carrier, with a fleet of more than 93,000 containers and trailers and 5,600 drayage tractors. In the same statement, J.B. Hunt disclosed that it had settled two lawsuits filed by drivers over unpaid wages and failure to provide meal and rest breaks in California, resulting in an $18.1 million hit on earnings in the third quarter. J.B. Hunt also said it would write off $2.6 million due to a customer bankruptcy filing. Although not identifying the customer, Mee told investment analysts in the conference call that the company in question was a discount retailer that had tried unsuccessfully to expand into the northeastern United States. On Aug. 6, National Stores Inc. filed for bankruptcy and announced plans to close 74 of its 344 stores in 22 states and Puerto Rico. Based in Gardena, Calif., National Stores does business as Fallas, Factory 2-U and Anna’s Linen by Fallas. Mee added that J.B. Hunt has “no exposure” to prominent retailer Sears Holdings Corp., which also filed for bankruptcy Oct. 15. Altogether, the charge-offs by J.B. Hunt are expected to lower earnings by $28.9 million, or 26 cents, for full-year 2018, the company said. For the first nine month, J.B. Hunt earned $400.9 million, or $3.63, on revenue of $6.3 billion. That compared with net income of $301 million, or $2.71, on revenue of $5.2 billion in 2017. Intermodal revenue rose 16% to $1.22 billion in the third quarter, and operating income rose 10% to $120.3 million. The number of loads increased only slightly as the company dealt with disruptions in its national network caused by five major derailments and service problems in some areas from Hurricane Florence. Revenue from dedicated contract carriage and final-mile delivery services grew a robust 24% to $543 million in the quarter, but operating profits dropped 18%, due in part to an $8.4 million charge to insurance and claims, $4 million in implementation costs for new contracts, and increased driver wages and recruiting costs, J.B. Hunt reported. In the freight brokerage segment, revenue and operating profits grew 28% and 40%, respectively. The gains came despite a 9% drop in revenue per load, which the company said reflected a higher mix of less-than-truckload shipments. J.B. Hunt’s over-the-road truck business increased 14% to $106 million in the quarter, and operating profits surged 60% to $9.2 million as rates per loaded mile climbed 19% compared with a year ago. The company operated a fleet of 1,972 tractors at the end of the quarter versus 2,040 a year ago. J.B. Hunt, based in Lowell, Ark., ranks No. 4 on the Transport Topics Top 100 list of the largest for-hire carriers in North America and No. 6 on the Transport Topics Top Top 50 list of the largest North American logistics companies.